We’ve all heard about the Achilles heel. That code word for vulnerability can also be applied to the ankle, an intricate system of bones and joints that is the linchpin of mobility and independence. Arthritis and gout are two common causes of ankle pain in adults. Cushioning between the bones in the ankle is provided by articular cartilage, which covers the ends of the bone where they intersect, and synovium, a thin tissue that lines the spaces between the bones and that secretes a lubricating fluid (synovial fluid). Damage to any of these components of the ankle, whether from injury or disease, can cause ankle pain. Ankle sprains, one of the most common ankle ailments, occur when a ligament in the ankle is stretched beyond its normal range, causing injury to the ligamentous tissue. 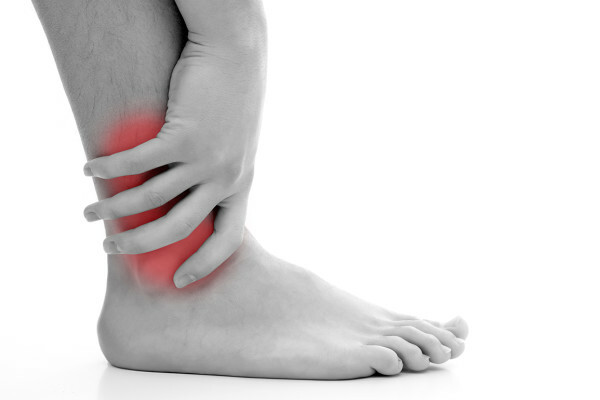 Ankle sprains are the chief culprit in most forms of ankle pain. The most common ligaments involved in ankle sprains are the anterior talofibular ligament and calcaneal fibular ligament on the lateral or outside aspect of the ankle. Approximately half of all ankle sprains occur in athletes and usually involve twisting, rolling, or turning of the foot beyond its normal range. When the ligament is severely stretched, the ligamentous fibers can actually tear. A partial tear of the ligament is called a grade 2 sprain; a complete tear is called a grade 3 sprain; a grade 1 sprain results from a ligament that has been excessively stretched but not torn. Pain, swelling, bruising, and tenderness of the ankle are all common symptoms of ankle sprain. Most ankle sprains are diagnosed by physical exam and are treated with rest, compression dressings, and pain relief medications such as non-steroidal anti-inflammatory drugs (NSAIDs). Some grade 3 sprains may require surgical repair of the ligament. People who have had severe ankle sprains in the past may subsequently suffer from ankle instability and are more prone to future sprains. Ankle fractures involve fracture of any or all of the three bones that make up the ankle joint: the tibia, fibula, and talus. Ankle fractures can occur by many of the same mechanisms that cause ankle sprains: abnormal twisting, rolling, or turning of the ankle or foot. They are also a common injury that can occur in an automobile accident. Symptoms of ankle fracture can mimic those of ankle sprains, which is why most experts recommend that any ankle injury should be evaluated by a healthcare provider. X-rays are the tests most often used to diagnose ankle fracture. 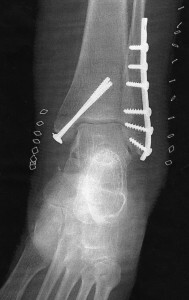 Treatment depends on the severity of the fracture, the bones involved, and the stability of the joint and may range from rest to immobilization of the joint to surgery using metal screws, rods, or wiring to keep the bones in place. Gout is a disease in which uric acid crystals accumulate in different joints of the body, causing intense pain. It most commonly affects the joint of the big toe, a condition called podagra, but it can affect the ankle joint as well, causing severe ankle pain. The pain is often sudden in onset (hence the phrase “gout attack,” a condition that in some can be averted via diet changes) and the ankle may become warm and swollen. In people with chronic gout, uric acid crystals may accumulate under the skin, forming hard, lumpy protrusions around the ankle. Gout treatment can involve pain control with NSAIDs, inflammation reduction with steroids, and a medication called colchicine. Prevention of future attacks can be aided by adopting a gout diet, one low in purine-rich foods such as organ meat and mackerel which are sources of uric acid. Rheumatoid arthritis is an autoimmune disease in which the body’s immune system attacks the synovial lining of joints causing pain, swelling, stiffness, and, in some cases, joint deformity. More than 90 percent of people suffering from rheumatoid arthritis will have involvement of the foot or ankle at some point, and typically, both feet or ankles will be affected. When the ankle is involved, people will initially have difficulty with inclines—walking up stairs, for example. Ultimately, the act of just walking or standing can cause significant ankle pain. Rheumatoid arthritis treatment involves treating the underlying disease with NSAIDs, cyclooxygenase 2 inhibitors (COX-2 inhibitors), steroids, and/or disease-modifying anti-rheumatic drugs (DMARDs) and using special orthotics and braces to stabilize the ankle. If rheumatoid arthritis results in significant deformity of the ankle joint, surgical repair of tendons that have been stretched or distorted may be indicated to maintain the integrity of the ankle. Pseudogout , which is caused by deposition of calcium pyrophosphate dehydrate crystals in the ankle joint. Click here to read our post Pseudogout May Be Linked to Dehydration. Lupus. Click here to read our post What Is Lupus? Defining an Immune System Disorder. Infectious arthritis, also known as septic arthritis. Click here to read our post What Is Septic Arthritis? Reactive arthritis, an arthritis that follows an infection of the gastrointestinal, urinary, or genital system. Despite the fact that osteoarthritis is the most common form of arthritis, it is a rare cause of ankle pain. When it does occur, destruction of cartilage between the bones of the ankle can cause pain and stiffness. Ankle osteoarthritis is treated, like all osteoarthritis pain, with NSAIDs or COX-2 inhibitors, among other pain relief medications. Rarely, steroid injections into the ankle joint are performed for pain control and inflammation reduction. Psoriatic arthritis is an autoimmune form of arthritis that can occur in individuals suffering from the skin condition psoriasis, which is characterized by silvery, scaly skin lesions. Any joint in the body can be affected; the ankle is a commonly affected joint. Pain, stiffness, and swelling of the ankle—similar to the symptoms of other forms of arthritis—can occur. Treatment is similar to that for rheumatoid arthritis and includes treating the underlying disease with DMARDs, pain control with NSAIDs, and supportive care of the ankle with orthotics or braces. ankle gout, ankle osteoarthritis, ankle pain, anti inflammatory, anti inflammatory drugs, arthritis, arthritis treatment, bone, calcium, cartilage, chronic gout, cox 2 inhibitors, dehydration, diet, dmards, forms of arthritis, gastrointestinal, gout, gout attack, gout diet, gout treatment, gout uric acid, immune system, infection, infectious arthritis, inflammation, joint pain, lupus, non steroidal anti inflammatory drugs, nsaids, osteoarthritis, osteoarthritis pain, pain, pain relief, psoriasis, psoriatic arthritis, purine, purine rich foods, reactive arthritis, rheumatoid, rheumatoid arthritis, rheumatoid arthritis treatment, septic arthritis, skin, uric acid, uric acid crystals. what could severe pain at NGHT be caused by…..during the day just a general feeling of fatigue after walking awhile…I use ice at night to relieve the pain..